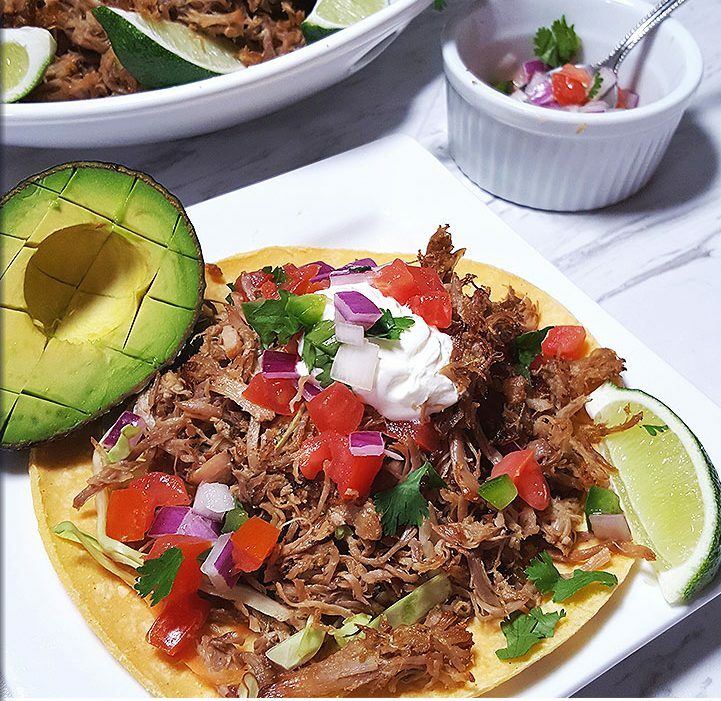 These Pressure Cooker Pork Carnitas are Crispy. Mexican Style Pulled Pork is crispy, yet deliciously moist and full of deep and complex flavors. Remove skin from Pork Shoulder. Cut Pork into 8-10 1/2 pound pieces and place into bowl. Add Rub ingredients and massage into pork. Select Sauté/Browning on your Pressure Cooker and allow to fully heat. Add about 3 inches of raw pork fat and Sauté for three minutes to render fat. Add the juice of one Orange and deglaze cooking pot. Turn off Pressure Cooker. Place seasoned Pork Chunks in cooking pot. Add chopped Onions, Garlic, Cinnamon Sticks and Bay Leaves. Squeeze in the juice of three Oranges and one Lime, Beer and toss the top of the pot with the orange skin. Remove Meat from cooking pot and place into a Strainer to drain liquid. Place drained Pork into a Bowl. With 2 forks, shred the Pork well. Select Sauté/Browning and adjust to Low heat. Simmer for 10 minutes to reduce liquid. Pour liquid into a large Measuring Cup and skim off fat. Heat Cast Iron Pan on Medium High for 10 minutes. Add Olive Oil and add some Shredded Pork to the Skillet. Wait one minute and add in 1/2 cup of the Hot Carnitas Liquid. Fry on one side, until Liquid has evaporated. Place Carnitas onto serving platter. Repeat until done. Drizzle over a little of the Carnitas Liquid. Squeeze a lime and sprinkle over Chopped Cilantro. This recipe is for a 6 qt Instapot which has a lower temperature than a conventional pressure cooker, so adjust the recipe as required. In a 15 quart pressure cooker like the one I bought for the club, the pressure is about the same, so keep the same cook time. The recipe can be tripled in our pressure cooker. We have successfully used a 18 pound package of pork shoulder for the recipe.